Lately, more attention has been given to women in music history but nearly all of it has been on the composers. So here's a little about the performers. Ladies and respectable women were not supposed to play music in public during various times in history, including the Renaissance. But that doesn't mean women only played music for their families. The two ideas that influenced whether a woman could play for an audience were her social class and what was considered a public performance. First off, it was the women of the upper classes who were most restricted when making music in public. For women of the lower classes, it was another story. There are quite a few records of amateur female musicians, and nearly all the words for musician had female variants, which tells us in no uncertain terms that women were traveling and court musicians. 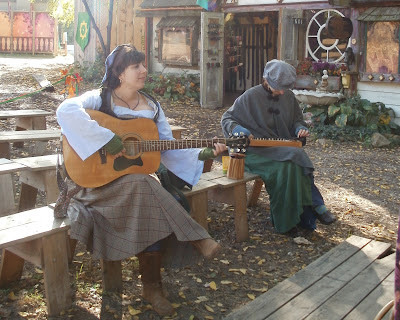 Trobairitz were upper class poet musicians in France; menestrelles and jongleresses were wandering minstrels and entertainers in France; gliewmedens were traveling musicians in England -- just to list a few. 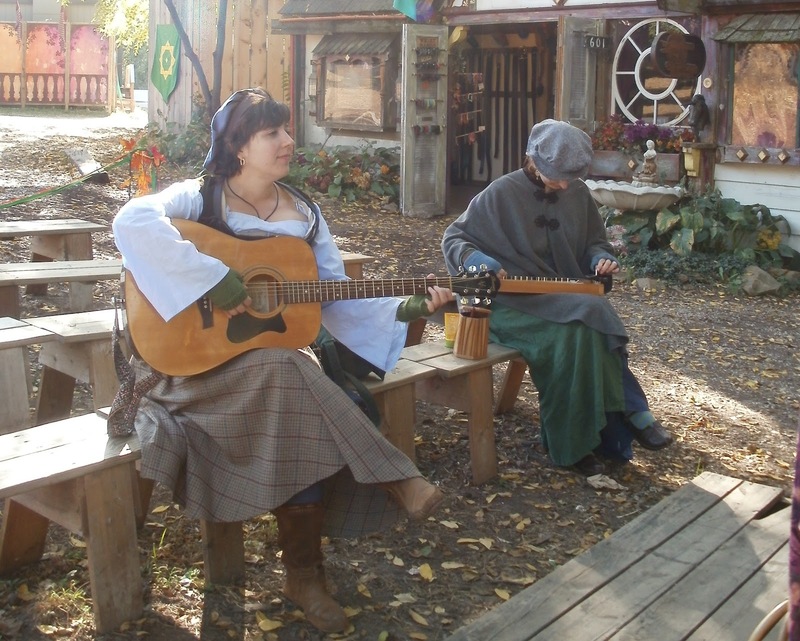 Occupations were closely linked to family, so if a woman came from a family of musicians, she could easily be expected to learn to sing, play or write music to help support the family. If a woman played music as part of a group, especially one made up of her relatives, it was more acceptable than playing alone. In addition, there were a number of groups made up of all women that achieved widespread fame. They were more likely to gain musical acknowledgement if they had a high ranking patron (the Concerto delle Donne in Renaissance Italy is one famous group) but female groups certainly existed outside the courts of Kings and Dukes as well. Next we have to understand how public vs. private was perceived at the time. Playing on the street for anyone who happened to be walking by was public and very risky for any female musician (and not so good for male musicians for that matter). But inviting 20 or 200 people from the “right” social class to a concert in someone’s home or court (and the occasional concert hall) was usually just fine. Even if a woman was playing. The real issue was who was going to be watching. Restricting the audience to the upper classes made it much more acceptable for women to play. It also made it more acceptable for the upper classes to listen to a lower class musician, male or female. Many male musicians owed their careers to these concerts and the female patrons who often ran them. A number of these “private” concerts became the unofficial centers of politics and government. The other group of female musicians to be considered are the women labeled as courtesans. Courtesans in general were a class of women who were certainly not respectable, but still associated with the upper classes regularly. They were expected to be accomplished in music and art and able to hold their own in educated discussions. Female musicians could be labeled as courtesans to make it clear that they were skilled musicians and give them the ability to mingle with the upper classes even if they did not offer other services. But that courtesan label was not always very easy to live with and made it clear that female musicians were not respectable even when they were honored for their music. But to be fair, most male musicians were not thought of as respectable either. Female singers in general were given a little more wiggle room simply because their voices couldn’t be replaced. Countertenors, boy sopranos and castrati were popular and could sing in the same range as women and were used for female roles at times, but their voices just weren’t the same and music fans knew this. And singing, in general, was given more respect than playing an instrument, so exceptions could be made for vocalists that would not be allowed for instrumentalists. 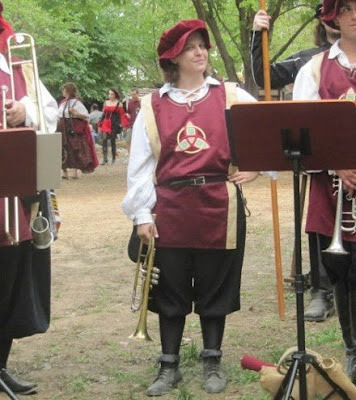 Just like today, various instruments were considered more feminine than others, although the rules about what made an instrument feminine were quite different. Women were steered away from any instrument that required “facial or physical contortions” which lets out nearly all the winds and brass and many percussion instruments. Flutes and cellos were right out; recorders and harps were iffy. Keyboards, small lutes and any instrument that allowed women to sit in “ladylike” positions while playing were much more acceptable. Not too surprisingly, quite a few women went ahead and learned the instrument they wanted to play in spite of these rules. There were many, many papers and treatises lecturing women for playing the “wrong” instruments. Women were strongly discouraged from playing brass. Liza/Andrew of the Gaelic Brass finds it easier to cross dress than explain why a woman is leading a brass ensemble for the Mayor and Court. A tactic used throughout history. Gwyneth the Feral Flute. 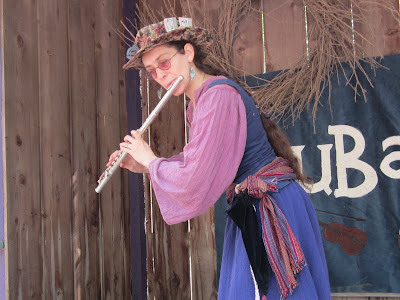 One argument used against women playing wind instruments was that their clothing made breathing difficult. Many women at the Ren Fest modify our costumes in some way (one-size larger than standard, strategic lacings left loose, etc.) so that we can breathe properly. We have basically chosen music over fashion. Ivy of Vespaer and Ivy on drum. 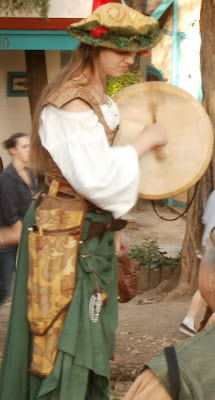 Drum has shifted wildly over the years from men to women. 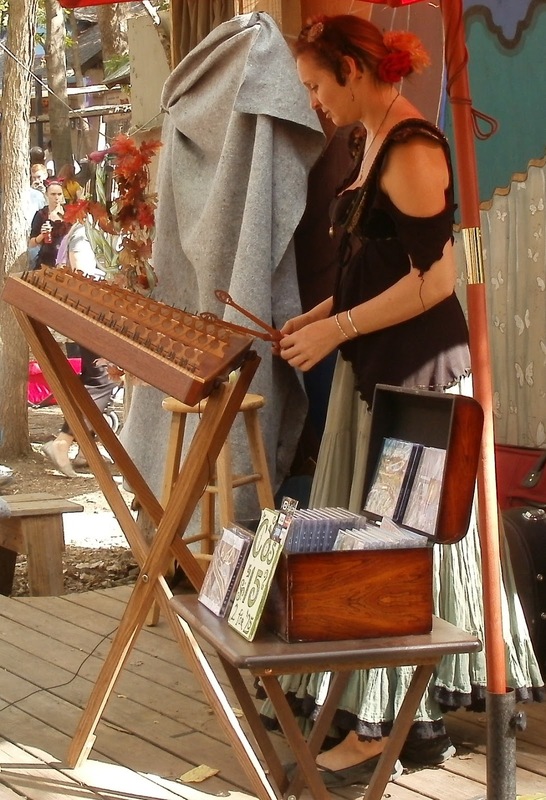 Generally, the larger or more important the percussion is to the music, the more likely it was for a woman to have trouble being allowed to play. Dulcinea. The dulcimer was one of the more approved ladies instruments although some cultures considered it too rustic for upper class women. 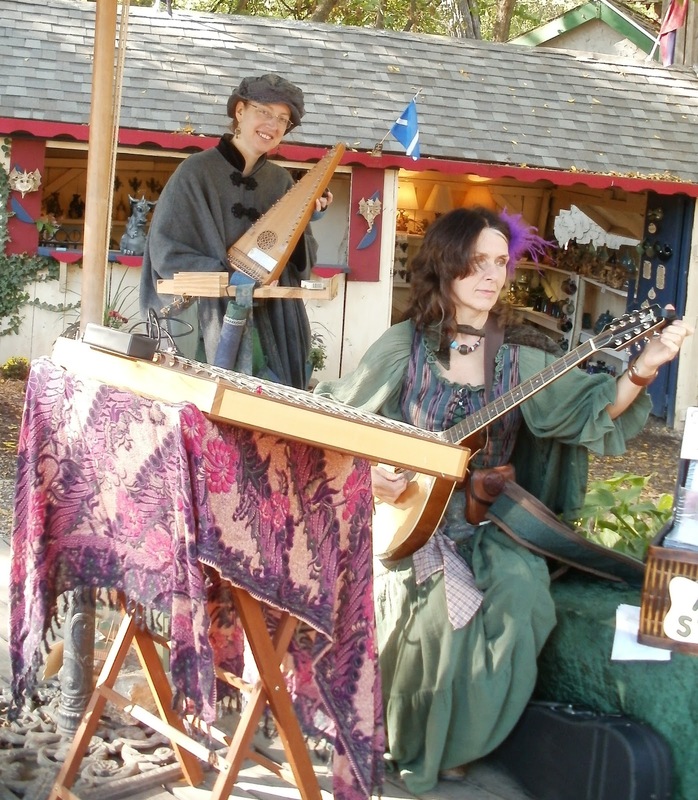 Apryl Knight of the Tulstin Troubadours with the psaltery and Matty Striker with the cittern. 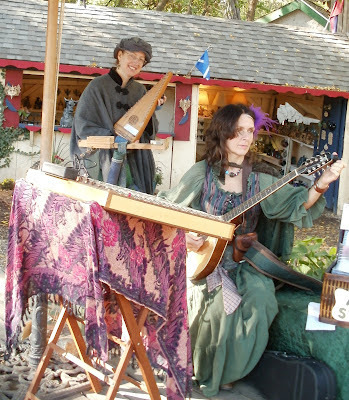 The cittern was the go to instrument in the Renaissance, similar to how the guitar is used today. Sally Tenpenny and Apryl Knight tuning up. Guitars were more likely to be considered a man's instrument than a woman's. 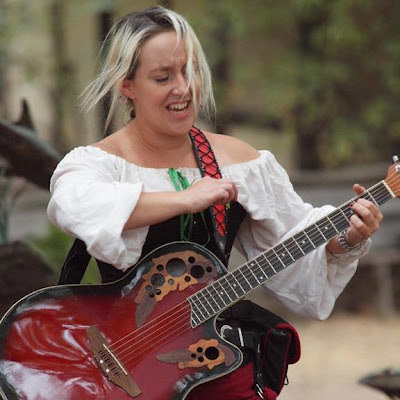 But guitars developed from lutes and small lutes were among the accepted instruments for women to play in many times. Learning music was often a requirement for a basic education, but making music for a living was seriously frowned upon. Male or female, musicians had something of a shady reputation even when people couldn’t live without having a personal musician working for them. Women often found it easier to step out of the spotlight to some degree by choosing their audience carefully, playing with a group or supporting other musicians. But others found that stage irresistible and proceeded to prove their musical right to be there.